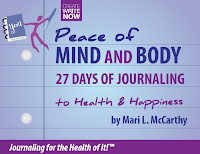 As I continue through Mari's workbook, 27 Days of Journaling to Health and Happiness, I am actually making some discoveries and these discoveries are leading to some interesting reactions that stem from "Oh, yeah, I already realized that" to "WTH? ME?" During the Day 3 exercise, I wrote about one of the main stress triggers in my life. I wrote about why this particular trigger brings on some much stress. The next step was to write about the effect this stress has on my body. Stress of this magnitude has a huge effect on my body. I feel myself steaming up and my breathing gets faster. My mind then begins to race with angry thoughts and high frustration. My heart beat gets faster and louder the angrier I get which leads to a headache followed by my neck muscles tightening and cramping and my brow furrows even more (if someone saw me at this point they'd swear I was a demon). I pick at my hands, rock back and forth and, eventually, start eating. Furthermore, I will snap at anyone who talks to me whether I know them or not and I am unable to make decisions because I cannot think clearly. This trigger really takes its toll on me. Of course, what really happens is that I ALLOW this trigger to have this effect on my body. I have learned, over the years, to deep breathe in an effort to ward off such extreme results from stress. And, while it works most of the time, I do let it get away from me on occasion. Writing this down has shown me that, if I don't control my reactions to stress related people/situations/events, I'm going to have a dang heart attack. And THAT'S what I learned on Day 3. Whew! Not sure if this is for people who live outside the US, but the book sounds good. Maybe if I would analyze myself this way I´d find out why I can´t stick to a diet. Betty- Consider yourself entered! I don't know if they'll send a print copy out of the US but they did not specify US only. They are also offering an ebook copy. If you win, you get a choice!